A falcon enthusiast who works in the Sears Tower watches the Wacker pair for Mary, since she works in an office directly across from the nest. The enthusiast reported that she’d seen chicks on Wednesday, so today, Mary and I went to the Wacker building to see the chicks. Our other mission was, of course, the female’s legbands. By the time we left for Wacker Drive, the pleasant morning’s temperature had dropped about 20 degrees and a frigid wind blew in from the lake. 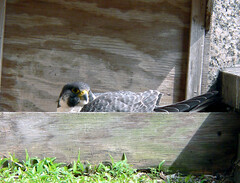 So, it surprised us not at all when the adult female refused to budge from the nest the entire time we watched. As per usual, we had about 20 seconds of ledge time before the ever-vigilant male, Etienne, silently dropped onto the ledge between us and the nest. The poor little guy had trouble maintaining his footing on the ledge as the wind whipped up the side of the building, but he stayed to protect his family anyway. Good Dad! Because I mainly watched the MCC pair last year, I don’t have a lot of experience with the actual nesting behaviors, but I did notice right off the bat that the female sat slightly higher in the nest than last week. Mary pointed out how she held her wings more tightly to her body as well. The picture above is from today, while the picture to the right is from last week. 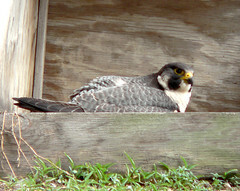 Mary said that was the typical posture of a falcon sitting on chicks rather than brooding eggs only. She likely had the chicks tucked securly under her thick breast feathers and the remaining eggs back under her legs. One has to appreciate holding that stance for hours on end! Sadly, we couldn’t stay forever, so we left the Wacker pair in peace. On our way back down to the car, I saw a dead bird on the sidewalk and Mary stooped to pick it up and secure it in her bag, much to the horror of the lunchtime business crowds. Hee hee. So, let’s see, how about a little MCC news. Thursday, Sean and I met our friends Liz and John at a new bar just up the street from our house called the Plymouth Restaurant and Bar. It’s in a three story building that has been derelict since we moved to the south loop in 1998. Nice to see something finally move in there! The exciting thing about this venue is that it has a rooftop bar! John and I arrived slightly before Liz and Sean and were very pleased with the view of State Street and the little park at the corner of State and VanBuren. I will say, however, this is hardly a quiet spot – lots of ‘el, traffic and human noise. I told John that I thought we’d probably see one or both MCC adults sometime during our stay since they hunt that park area with some frequency. About a half hour later, after Sean and Liz had shown up, one of the adults indeed flew over us, heading towards Grant Park. This caused some small excitement, since Liz and John had only ever seen one via my pictures. However, the adult was flying up very high, so it was hard to see much. Fortunately, my MCC birds topped this showing! We saw one coming back from Grant Park and disappear over the building to our west, heading back nestward. Seconds later, a huge flock of pigeons came careening from the west, down VanBuren. We all turned and, sure enough, one of the adults followed hot on the heels of the flock of pigeons. Right at the corner of VanBuren and State, the falcon got one of the pigeons and veered south down State Street carrying the obviously dead bird in his or her talons. This was all close enough that you could actually easily see that he’d broken the pigeon’s neck upon impact. I don’t know how, but John missed the whole thing. Liz, however, was suitably impressed. We were there for about an hour more and saw an adult soaring around over head a number of times. SO! That’s TWO places in the Chicago Metro region where one can drink a nice cold beer and watch Peregrine Falcons! I should write a guide book. ~ by Steph on May 11, 2007.